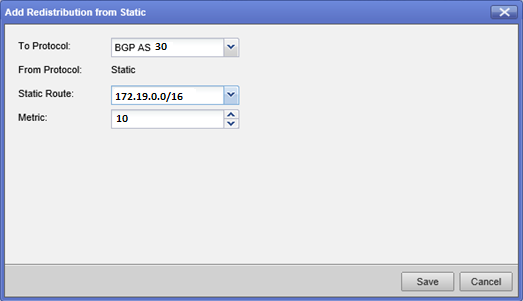 This article describes how to setup and use BGP 'AS_PATH' Attributes on Check Point Gaia OS. 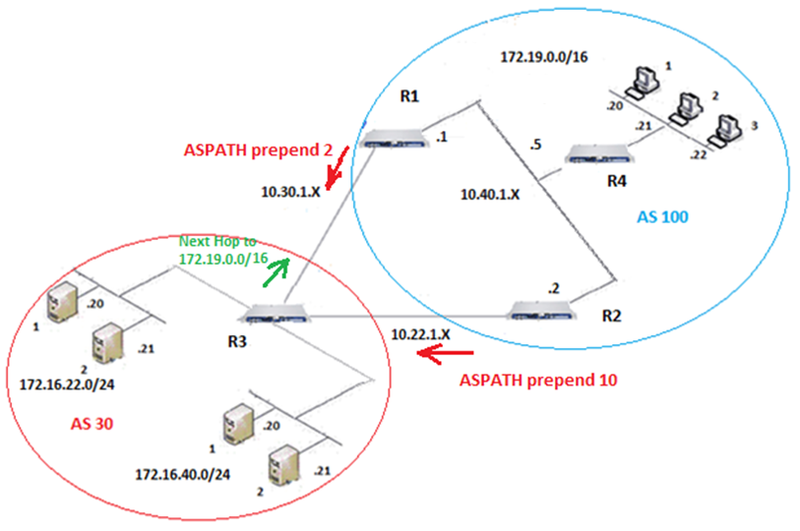 This article focuses on configuration of 'AS_PATH' Attributes related to BGP. It is assumed that administrator has basic knowledge of routing in general and BGP in particular. For more details on BGP 'AS_PATH' Attributes, refer to RFC 4271 and other related BGP RFCs. Before starting the configuration, administrator should be familiar with BGP and underlying features and their configurations such as static and dynamic routing, ClusterXL, VRRP cluster, SAM card configuration on 21000 appliances. For more details, refer to "Related documentation" section. Path attributes are used by BGP to determine a path to the network. Each BGP update consists of one or more networks and set of attributes attached to them. BGP uses path attributes to provide more information about each route and to help prevent routing loops in an arbitrary topology. Administrator can also use path attributes to determine administrative preferences. BGP collapses routes with similar path attributes into a single update for advertisement. Routes that are received in a single update are re-advertised in a single update. BGP always propagates the best path to the peers. Note: Well-known Attributes must be recognized by all BGP implementations. Mandatory attributes must be always included and carried in all BGP update messages to peers. The BGP implementation has to recognize the attribute, accept it and also advertise it to its peers. When a router originates a route in BGP, it sets its Origin Attribute. IGP: Set if Network Layer Reachability Information (NLRI) was learnt from an internal routing protocol of the originating AS. EGP: This Origin Attribute specifies that the NLRI was learnt from EGP. Incomplete: Set when the NLRI was learnt from some other means, such as redistributed routes into BGP. The information to determine the 'Origin' for such routes (redistributed routes) is not complete since the origin of these routes cannot be determined. 'IGP' is the highest preferred 'ORIGIN' value. 'EGP' is in the middle. 'Incomplete' is the lowest preferred 'ORIGIN' value. 'AS_PATH' Attribute gives a list of AS Numbers traversed when reaching to a destination. Every BGP speaker, when advertising a route to a peer, will include its own AS number in the NLRI. The subsequent BGP speakers, who advertise this route, will add their own AS number to the 'AS_PATH', the subsequent AS numbers get prepended to the list. The end result is the 'AS_PATH' attribute is able to describe all the Autonomous Systems it has traversed, beginning with the most recent AS and ending with the originating AS. BGP uses this mechanism to detect routing loops. 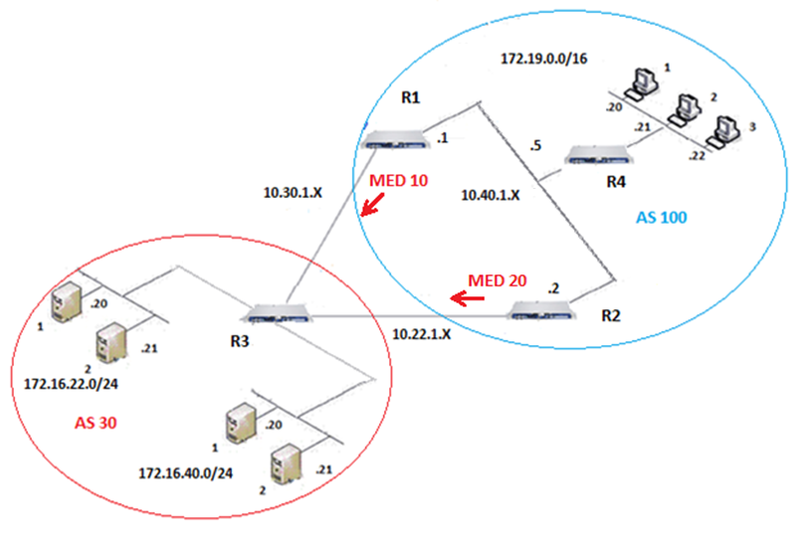 Routers in an AS will reject the routes when its own AS number is detected in the route advertisement. 'AS_PATH' can be used as a decision factor in route selection. By using "AS_PATH prepending" feature, administrator can influence the routing decision of BGP speakers in other Autonomous Systems. "AS path prepending" adds the local AS number to the current location in the AS path as many times as the administrator specifies. If the BGP Peers are in different Autonomous Systems, then the 'NEXT_HOP' IP address that will be sent in the update message will be the IP address of the advertising router. If the BGP peers are in the same Autonomous Systems (iBGP Peers), and the destination network being advertised in the update message is also in the same AS, then the 'NEXT_HOP' IP address that will be sent in the update message will be the IP address of the advertising router. If the BGP peers are in the same Autonomous Systems (iBGP Peers), and the destination network being advertised in the update message is in an external AS, then the 'NEXT_HOP' IP address that will be sent in the update message will be the IP address of the external peer router which sent the advertisement to this AS. Discretionary Attributes are recognized by the BGP implementation, but may or may not be sent in a specific 'UPDATE' message. It is up to the discretion of BGP Implementation to send or not to send these attributes in the update messages to the BGP peers. 'LOCAL_PREF' (Local Preference) Attribute is only used in updates sent to the iBGP Peers. It is not passed on to the BGP peers in other Autonomous Systems. 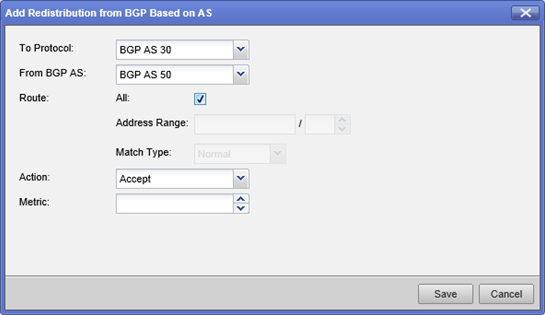 This attribute specifies the BGP Speaker's degree of preference for an advertised route. The higher the value of Local Preference attribute the more preferred the route is. Note that the Local Preference will only affect the traffic leaving the AS. 'ATOMIC_AGGREGATOR' Attribute aggregates routes that are non-identical, but point to the same destination. In effect, it summarizes the routes when advertising them to the BGP peer. When a router receives routes for the same destination, it makes the best path decision by selecting the more specific path. When aggregation is performed, the BGP Speaker starts advertising the less specific routes to its peers, but the path detail information is lost in this process. Anytime a BGP speaker does this aggregation by summarizing more specific routes into a less specific route, it has to inform its downstream BGP peers that aggregation has been done - this is done by attaching the 'ATOMIC_AGGREGATE' attribute to the update message. When the downstream BGP speakers receive the route with 'ATOMIC_AGGREGATE' attribute set, then they cannot advertise the more specific routes for this aggregated route, and they will have to keep the 'ATOMIC_AGGREGATE' attribute attached when advertising this route to their BGP peers. Note: Optional attributes may or may not be supported by the BGP implementations. BGP process has to accept the path, in which it is included, and should pass it on to other peers, even if these attributes are not supported. Meaning, if any optional attribute is not recognized by a BGP implementation, then BGP looks to check if the 'Transitive' flag is set. If this flag is set, then BGP implementation should accept the attribute and advertise it to its other BGP Peers. BGP communities allow administrator to apply a common routing policy across multiple BGP peers that are in the same group. This attribute simplifies the policy enforcement by grouping a set of BGP peers with common properties to share a common set of policy. Routing decisions are based on the identity of the group or community. To implement this feature, administrator should map a set of communities to certain BGP local preference values. Then administrator can apply a uniform BGP configuration to the community as a whole as opposed to each router within the community. The routers in the community can accept/restrict routes that match their community values. NO_ADVERTISE 0xFFFFFF02 Not advertised outside a BGP confederation boundary. A stand-alone Autonomous System that is not part of a confederation should be considered a confederation itself. NO_EXPORT 0xFFFFFF01 Not advertised to other BGP peers. NO_EXPORT_SUBCONFED 0xFFFFFF03 Not advertised to external BGP peers. This includes peers in other members' Autonomous Systems inside a BGP confederation. For further details, refer to RFC 1997 and RFC 1998. A route can carry more than one community attribute and the BGP peer that receives such a route with multiple community attributes can act based on one, some or all of the community attributes. A router can also add or modify the community attributes before passing them to other BGP peers. If the 'Transitive' flag is not set, then BGP implementation can quietly ignore the attribute, it does not have to accept and advertise this attribute to its other peers. 'Multi-exit Discriminator' (MED) values are used to help external neighbors decide which of the available entry points into an AS are preferred. A lower MED value is preferred over a higher MED value and breaks the tie between two or more preferred paths. Note that MED is not passed beyond the receiving AS. It is only used to influence traffic between two directly connected Autonomous Systems. In addition, MED is never compared when the routes to the same destination are received from two or more different Autonomous Systems. MED only applies to the routes advertised by a single Autonomous System. Note: A BGP session does not accept MEDs from an external peer, unless the 'Accept MED' field is set for an external peer. AS_PATH Identifies the Autonomous Systems, through which routing information carried in an 'UPDATE' message passed. Components of this list can be AS_SETs or AS_SEQUENCES. NEXT_HOP Defines the IP address of the border router that should be used as the next hop to the destinations listed in the 'UPDATE' message. MULTI_EXIT_DISC Discriminates among multiple exit or entry points to the same neighboring Autonomous System. Used only on external links. LOCAL_PREF Determines which external route should be taken and is included in all iBGP 'UPDATE' messages. The assigned BGP speaker sends this message to BGP speakers within its own Autonomous System, but not to neighboring Autonomous Systems. Higher values of a 'LOCAL_PREF' are preferred. ATOMIC_AGGREGATE Specifies to a BGP speaker that a less specific route was chosen over a more specific route. The BGP speaker attaches the 'ATOMIC_AGGREGATE' attribute to the route when it reproduces it to other BGP speakers. 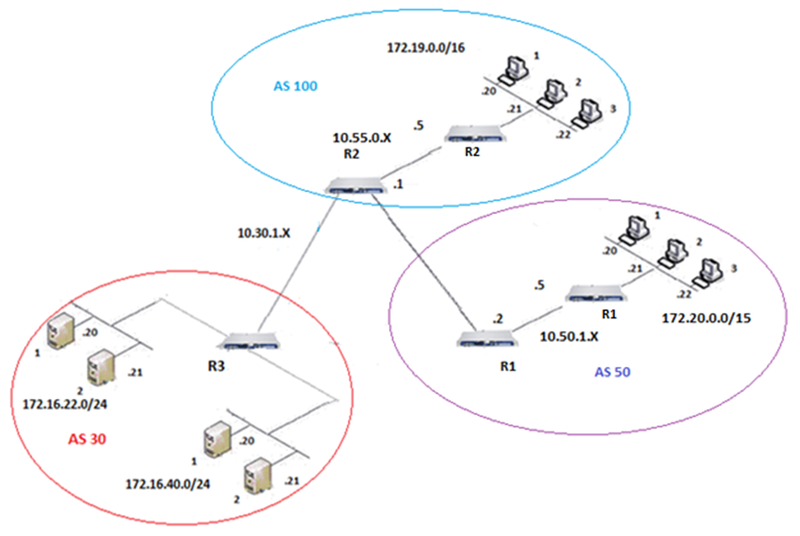 The BGP speaker that receives this route cannot remove the 'ATOMIC_AGGREGATE' attribute or make any Network Layer Reachability Information (NLRI) of the route more specific. This attribute is used only for debugging purposes. BGP Best Path Algorithm selects the first valid path in the list of valid paths as the current best path. It then compares the best path with the next path in the list, until BGP reaches the end of the list of valid paths. Prefer the path with the highest Local Preference ('LOCAL_PREF' has a value of 100 by default). Prefer the path with the shortest 'AS_PATH'. Prefer the path with the lowest origin type (IGP (lowest) < EGP < INCOMPLETE (highest)). When ECMP is disabled, MED is compared only if the first (the neighboring) Autonomous System is the same in the two paths. When ECMP is enabled, this check is skipped. Gaia OS supports MED values from 0 to 2147483646. The advertised MED should belong to this range. Paths received with MED value of "-1" (which means "No MED") will not be compared. Prefer eBGP over iBGP paths. Prefer the path with the lowest IGP metric to the BGP next hop (only works for iBGP). 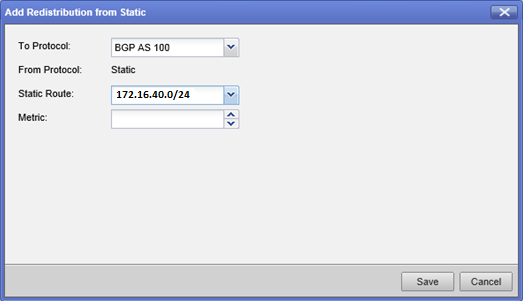 Prefer the route that comes from the BGP router with the lowest router ID. The following sections will cover configuration for BGP Path Attributes. The configuration of these attributes must be identical on all members of VRRP cluster or ClusterXL. For basic configuration of BGP, refer to sk95967 (BGP on Gaia OS). Configuration of some BGP Attributes is possible only via 'routemap' command in Gaia Clish - refer to sk100501 (How to configure Routemaps in Gaia Clish). We need to redistribute static route 172.20.0.0/16 into AS 100 via R2 using routemaps. 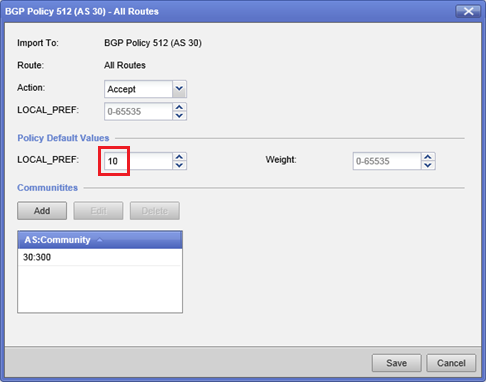 Go to "Advanced Routing" - click on "Route Redistribution"
Click on "Add Redistribution From" button - select "BGP based on AS"
In "To Protocol" field, select "BGP AS 100"
In "From Protocol" field, select "Static"
In "Static Route" field, select "172.20.0.0/16"
We need to redistribute route 172.20.0.0/16 received from AS 50 (via R1) to AS 30 (via R3) using routemaps. Go to "Advanced Routing" - click on "Inbound Route Filters"
Click on "Add" button - select "Add BGP Policy (Based on AS)"
Click on "Add Redistribution From" button - select "Static"
In "To Protocol" field, select "BGP AS 30"
In "Static Route" field, select "172.19.0.0/16"
We need to match AS 50 to accept routes originating from AS 50 and reject routes originating from AS 100. Click on "Add" button - select "Add BGP Policy (Based on AS-PATH)"
Autonomous System Path prepending helps administrator to use 'AS_PATH' as a decision factor in selection of routes in other Autonomous Systems. "AS path prepending" adds the local AS number to the current location in the AS path as many times as the administrator specifies. We need to accept routes from AS 100. Configuration is performed only in Clish. We use route redistribution routemap called "ToPeer-R3". Local Preference determines which is the preferred exit point for external route and is included in all iBGP 'UPDATE' messages. The higher the value of Local Preference attribute, the more preferred the route is. Note that Local Preference will only affect the traffic leaving the Autonomous System. In the example below, R3 advertises two networks 172.16.22.0/24 and 172.16.40.0/24 into As 100 via R1 and R2. By applying higher value of Local Preference on R2, administrator can ensure that traffic from AS 100 to AS 30 networks will be forwarded by R2 over R2-R3 link. In "Static Route" field, select "172.16.22.0.0/24"
In "Static Route" field, select "172.16.40.0/24"
We set the Local Preference value 10 to AS 30 routes. We set the Local Preference value 20 to AS 30 routes. The Multi-Exit Discriminator (MED) is used to suggest to an external AS the preferred route into the Autonomous System. Since lower value is preferred, R3 in AS 30 will select route from R1 for network 172.19.0.0/16. MEDs are advertised throughout the local Autonomous System. We redistribute route 172.19.0.0/16 to AS 30. In "Static Route" field, select "172.19.0.0.0/16"
Configuration is performed only in Clish. We import routes from AS 100. For MED to work on R3, 'accept-med' should be enabled on R3 for both BGP peers. In BGP Communities configuration, routing decisions are based on the identity of the group or community. To implement this feature, administrator should map a set of communities to certain BGP local preference values. 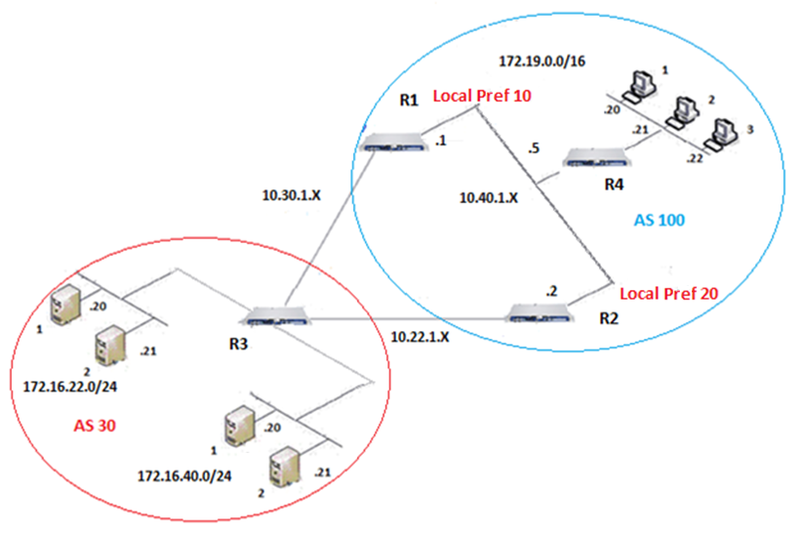 Then administrator can apply a uniform BGP configuration to the community as a whole as opposed to each router within the community. The routers in the community can capture routes that match their community values. BGP Communities can be configured in Clish and using the 'routemap' command. The example below shows how BGP communities can be used to filter routes, which can later be used by peers to set specific policy for those routes. Administrator needs inbound traffic from AS 100 destined to 172.16.22.0/24 to come over R2-R3 link. However, in case of failure of R2, the traffic should come on R1-R3 link. To achieve this policy, we can use 'Community Attribute'. R3 announces network 172.16.22.0/24 with prefix community attribute 30:300 and 172.16.40.0/24 with prefix community attribute 30:250 to R1 and R2. R1 and R2 filter network 172.16.22.0/24 with Community ID 30:300, while R1 applies 'LocalPref' of 10 and R2 applies 'LocalPref' of 20 to this network. Since higher value of 'LocalPref' is preferred, traffic towards 172.16.22.0/24 is sent via R2, except when R2 fails, the traffic can pass via R1. 172.16.40.0/24 with prefix community attribute 30:250 is rejected as R1 and R2 do not belong to community 250. Configuration is performed only in Clish using routemaps. We match community 300 on AS 30 and apply 'LOCAL_PREF' of 10. We match community 300 on AS 30 and apply LOCAL_PREF of 20. Note: BGP Community Attribute is presented in format "AA:NN", where the first part ("AA") is the AS number, and the second part ("NN") is a 2-byte community number. Traffic from AS 100 to AS 30 will go via R2 over R2-R3 link. However, if R2 fails, the traffic will flow via R1 over R1-R3 link. 600 / 700 / 1100 / 1200R / 1400 Appliances Advanced Routing Reference Guide (R75.20, R77.20). RFC 1771 - A Border Gateway Protocol 4 (BGP-4). RFC 1997 - BGP Communities Attribute. RFC 1998 - An Application of the BGP Community Attribute in Multi-home Routing.